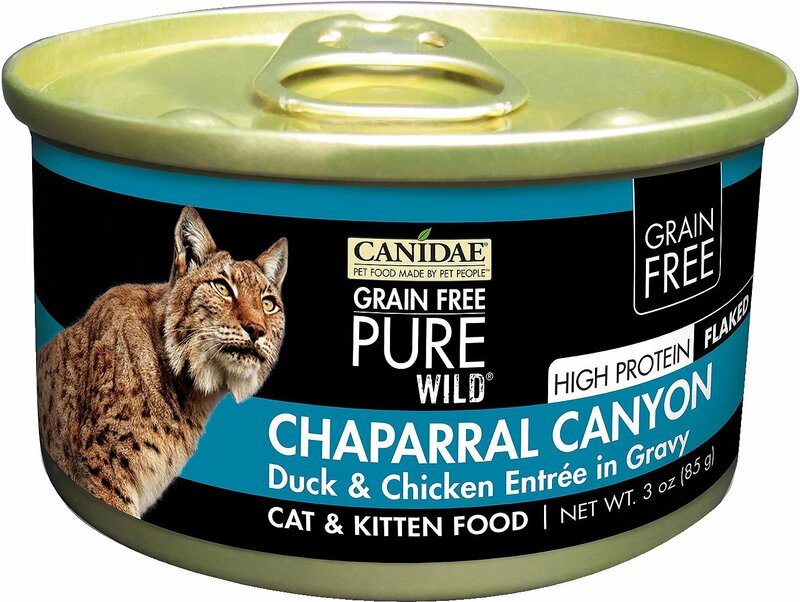 Unleash your favorite feline’s passion for the meaty flavor he craves with CANIDAE Grain-Free PURE WILD Chaparral Canyon with Duck & Chicken Canned Cat Food. 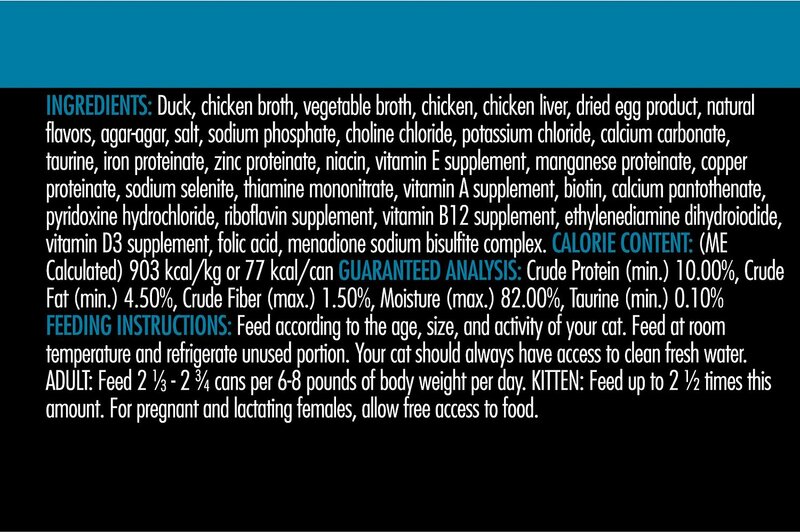 This premium, high-protein meal features real duck as the very first ingredient, along with chicken, chicken liver and dried egg, to provide the energy and nutrition your active cat needs to thrive. Thanks to the grain-free recipe of this delicious food, it’s easy for him to digest and ideal for the cat with allergies or food sensitivities. The savory flakes in gravy provide a meaty texture and flavor your little tiger will go wild for. Real duck is the very first ingredient in this premium, protein-packed meal that also includes chicken, chicken liver and dried egg. The grain-free recipe is easy on his digestion and ideal for the cat with allergies or food sensitivities. Your cat will go wild for these savory, meaty flakes in gravy whether served as a complete meal or a delicious topper over dry kibble to add variety to his diet. Feed according to the age, size, and activity of your cat. Feed at room temperature and refrigerate unused portion. Your cat should always have access to clean fresh water. Adult: Feed 2 1⁄3 - 2 3⁄4 cans per 6 - 8 lbs of body weight per day. KITTEN: Feed up to 2 1/2 times this amount. For pregnant and lactating females, allow free access to food. 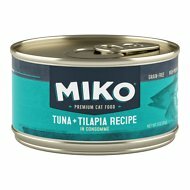 After about a month of training and teasing my cat with only small amounts of this item during meal times, she now makes this the first thing she goes for on her plate as I usually spoil her with 2 different flavors of wet food per meal. I figure cats want variety too just like we do. I have to say after doing much research on the web about which cat food is the best, this came up as one of them. It looks awful (kinda like vomit). Horrible texture. My cat wouldn't touch it and he LOVES duck. My cats seem to like this wet food the least of the canidae pure cans. They will generally eat it when their hungry, but as the pack whittles down I'm finding they eat less and less of the can at meal time. I won't be purchasing again. My cats enjoy this flavor a lot and it always disappears from the bowls. It is a little bit different variety than they usually eat, so I think they like the change of pace! My cat gobbles this food up! He loves saucier canned foods vs just the pate with less sauce. It’s not that important, but for some reason all of the labels on the cans were partially or fully peeled off. Adhesive issue? My kitten Mittens loves her canned cat food. She really loves the boxes that bring her food every 3 weeks. My cats are particular, and hate duck and chicken flavors from all other brands. But for some reason they love this flavor. I do however add raw instincts freeze dried chicken bits as a topper. But with other foods they don't like even with a topper they will walk away. I do notice that finicky cats have to be HUNGRY, to open they taste pallet. This approach has worked for me. I strictly feed them on a 12 hour gap or every 12 hours. They are a healthy weight of 12 lbs @ 3yrs old. Also, I chose this flavor because of the high protien percentage. 10%. The turkey flavor is even higher. Cat didn't care for it. My cat loves gravy, and while this product advertised "gravy," it really didn't have any. He didn't eat the product. Tried a different Canidae product, but my cats hate this too.